I had never really been interested in reading Stephen King’s thriller The Shining– that is, until I saw the movie adaptation and became fascinated by the twisted and suspenseful story. Eager to see what it would look like in writing, I immediately made it a goal of mine to read the novel as soon as possible. Though I was surprised by how different the novel was from what I had seen on-screen, I still enjoyed it immensely. A major strength of this novel is King’s impressive attention to detail, particularly regarding the backgrounds and development of the characters. Over time you come to realize that the Torrance family’s past is much darker and more complicated than first expected. It was simultaneously fascinating and unsettling to learn how Jack thinks, how he justifies his erratic and dangerous behavior even when it becomes harmful to his family. My favorite character was by far Mr. Hallorann, the chef at the Overlook Hotel who shared Danny’s “shining” abilities. Not only is he one of the only logical, sane people in this story, but he is also an incredibly caring and brave person. I loved his relationship with Danny and the way he seemed to care about him as though the boy was his own son. 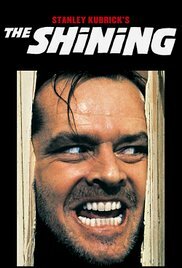 At this point Stanley Kubrick’s 1980 movie adaptation of The Shining has become so iconic that is can be difficult to separate the novel from the film. Both the book and the movie adaptation have their own advantages and disadvantages, making it difficult to choose one over the other (so I won’t!). 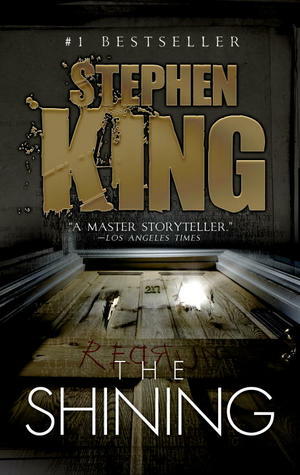 The book is obviously much more detailed in regard to the Torrance family’s background and further explains the extent of Jack and Wendy’s marital problems, Danny’s shining ability, and the financial desperation that prevents Jack from abandoning his job at the Overlook when circumstances take a turn for the worse. However, the downside to the incorporation of so many interesting details is that the pace of the plot slows down significantly, which is where the movie adaptation gains an advantage. Because fewer background details are shown on-screen, more time is dedicated to building as much suspense as possible and packing in the creepy punches. It seems as though most of the exciting action takes place in the last one hundred pages of the novel, meaning that the other five hundred or so pages could certainly use some more excitement. Key scenes in the movie are not in the book. I know this is opposite of what I usually tend to complain about when it comes to movie adaptations (more often it bothers me when movie adaptations leave out details from books) but I think this is because in this case I watched the movie before reading the book. This might be an unfair complaint to make, but I’m going to say it anyways because it nevertheless impacted my opinion of the novel. I eagerly waited to read about the creepy twin girls, Wendy reading the utter nonsense that Jack had been typing on his typewriter, and the climactic chase between Jack and Danny in the maze. The plot of the novel was fine the way it was and made sense with the story it told; however, part of me couldn’t help but feel disappointed that I wouldn’t get to read Stephen King’s description of Jack’s cold, icy face as he sat by the maze, defeated. Overall, Stephen King’s The Shining is a standout thriller in its attention to detail and incorporation of family dynamics, human nature, and the perspective of a child into a twisted, creepy story. Whether or not you’ve seen the movie adaptation or are a fan of thrillers in general, The Shining is one book that you must add to your TBR list! What are your thoughts on The Shining, either the book or the movie (or both)? Have you read the sequel? Let me know in the comments section below! I have yet to read it but I loved the movie. If the book is that slow, would you still recommend reading it to someone who’s not a fan of King’s overly developed characters? I think I would still recommend it, mostly because the premise of the hotel and its history is so interesting. It’s still suspenseful even though it’s slow, which makes it enjoyable nonetheless. That was one of my fears before I read The Shining! I felt better going into it after having already watched the movie adaptation because I pretty much knew what was going to happen next. Oooo I must start with this for my first King then. Unread a few pages of Mr.Mercedes and DNFed it so hopefully I enjoy this one as much as you did. I think this is a great one to start with because it’s so iconic. The movie is also fantastic to read before/after! I saw the TV mini-series (teleplay by King himself) first, then read the book, then watched the Kubric film. Since I’m very character focused, I preferred the book and mini-series. oooh, I had no idea that there’s a mini series! I’ll definitely have to check it out, because I tend to like character-focused stories better as well. The mini-series came out in the late 1990s and stars Steven Weber and Rebecca de Mornay. I loved the novel but I thought the film was let down by the choice of lead character. In the novel he’s supposed to be driven mad, but as I, and a lot of others already suspect that Nicholson is already bonkers, I think they might have chosen someone else even though he always does earn his pay. That’s a really good point. In the movie it seemed like Jack was inherently crazy, while in the novel he was driven insane by the Outlook Hotel itself. I think that distinction should really have been made more clear in the film. I have not read or even seen The Shining, but after your review I sure would like to see/read it. Thanks Holly!